We completed stop number three of NCBA’s Stockmanship and Stewardship tour in Montrose, Colorado. Ron Gill and I missed the first sessions as we helped set up the Priefert panels to get the pen how we liked it. We used a design that I think is best to display all the different things we want to show in our demos, and you can do it horseback or a foot. We made the entrance into the pens on what some people think is difficult, but it actually makes it easier to position yourself to creat direction and flow for the cattle to “decide” to go in the pens rather than be forced into the pens. Big difference. We wanted a tub to use as Temple Grandin was speaking and we new she would be able to really speak about it. It is really hard to find one that is portable and fits in the demo pen, so that is one reason we use a Bud Box so much. We like them both if they are designed and used properly. I made a joke in our demo that I wanted a tub system but Ron wanted a Bud Box. He didn’t find it near as funny as I did and neither did Temple. I tried to throw him under the bus, but the bus wasn’t moving. I’m sure there will be retaliation. The guys at the Montrose Event Center were really good to work with. Ray had earrings and tattoos. CJ was a country guy that dressed western. They both worked hard and Ray and I got into a discussion about work ethic. What I see is guys that have his style and character are hard working backbone of America kind of folks that provide lots of the labor that keeps things working. They are not going to be the managers or politician types, so they know they need to work hard to do their part. Just because a guy has a different style doesn’t mean he is not valuable to society. It was a good conversation. CJ was real interested in our presentation and wished his grandfather would come and watch. It was nice to get to see how dedicated these guys were to the job, and sure made our job much easier by going the extra mile. The afternoon speakers we got to listen to were great. They had a panel discussing benefits of implementing stockmanship moderated by Kevin Ochsner, of NCBA’s Cattleman to Cattleman. He did a great job of getting the most out of the very knowledgeable and different panel. They fed everyone a great steak Dinner and followed it with a tasting and comparing of different grades and cuts of meat. I think this is a great learning experience (when you can learn by eating steak how could it be bad). Last year at Fort Collins they did a similar program. They used a very high quality grass finished sample and several ranchers at my table picked it as their favorite and they didn’t like that. This year the grass fed(notice the difference in the word fed and finished)was not the same quality and no one picked it at our table as being desirable. I feel this is a very important point we need to see as producers. A quality steak is purchased for a quality eating experience. If the quality doesn’t meet the expectations of the person making the decision to eat a certain steak, they will try something else next time. That decision may be another protein like pork, chicken or fish. This is why I don’t think it’s smart for our industry to divide ourselves into categories and divisions. We need to find what the consumer wants(they don’t all want the same thing), educate them on real facts and truths, and provide them with a high quality eating experience with all their decisions. I feel that if you are trying to create a grass finished steak of quality from the same genetics that have been created for our high energy feedlot rations you are not going to create a highly marbled, good tasting steak. You can make real good hamburger, but that’s not what we are after. There is more and more demand for grass finished. Someone will fill the demand. Let’s do it with quality beef and in a positive as both competitors and partners all in the same business. Beef Quality Assurance is about quality in all categories. Temple finished the evening with a real good talk on issues in the industry and we called it a good day. The next morning started out in the Breakfast room at the hotel. This is where so much happens at theses conferences. Discussion and networking of attendees. Ron, Juan Reyes, and Temple had a nice discussion on all things beef, and Juan told us how he got started with the Stockmanship and dogs. It is so great to be surrounded by like minded people that are proud to be in the beef business. We got to the arena and the cattle and horses were there and ready to go. Juan worked his dogs a little to dog break the cattle and Ron and I sat and watched on our very nice horses. Doug, the fellow that was in charge of bringing the horses and cattle, was a guy that I instantly liked and new before we even saw them that the horses and cattle would be good. I would really like to ride and work with him. Just like Ray with the earrings, I think he knows he is never going to own his own big ranch, so he dedicates himself to the skills and art of being a stockman, and he and so many like him are why Beef Quality Assurance is as good as it is. I would learn and have some fun. Almost everything was good in the demos. We had plenty of time to explain and do. We worked quite a lot outside in the arena as I felt most of these folks were big country people and we would do well to discuss handling cattle outside. The corral work was done mostly on foot, but Ron did put the cattle through the Bud Box once horseback. I felt real good about the demo. The one mistake I made was not learning how to run the chute. It was a very good chute, but I didn’t know how to run it. My mistake. I’m not good at working a chute, and am terrible when I know nothing about it. It was not good for the demo or the chute provider that donated it, and I won’t let that happen again. Another word for experience is mistakes and I just got some experience. Juan then did a demonstration on handling cattle with dogs. 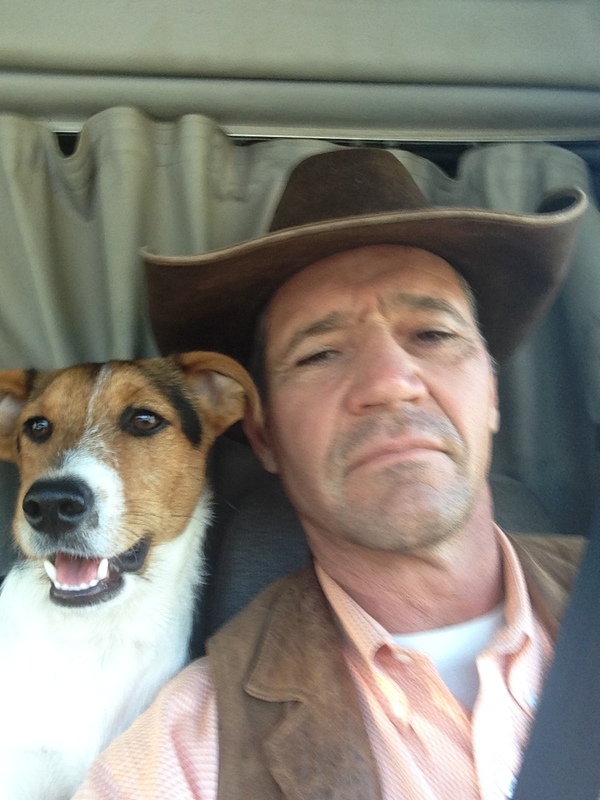 Real informative, valuable information on how to work cattle with dogs and a very good way of presenting it using humor, common sense and knowledge all thrown together. In the afternoon they had break out sessions. Libby Bigler asked me if I could do the portion on ATV use in cattlehandling. I might not have done it for anyone, but I would do anything Libby asked me because she is such a good person and so dedicated to BQA. I knew Ron and I could get it done from watching previous talks and some experience, and as I’ve said before Ron knows something about everything. I enjoyed doing them and I feel like we gave folks some insight in how to be safe in improve the pressure they create on machines handling cattle. They finished up with BQA training and a test to get certified in Beef Quality Assurance. I took the test and got recertification as it had been more than 3 years since I had certification online. I just want to try to paint a picture of what happens at these Stockmanship and Stewardship events. I feel they bring so much value for the time and money invested. Everyone works so hard to make it a worthwhile, valuable event for the producer. Boehringer Ingelheim has stepped up with funding, NCBA has a dedicated team that helps the local state BQA coordinator and extension folks put it together. It is a team effort, and the Montrose, Colorado event was real good. Everyone should be very proud of the effort. The next one is in Stephenville, Texas October 5 and 6. Then Pasco, Washington October 12 and 13. I would sure recommend attending and/or having employees attend. Even if you’re not in the beef industry I would try to attend to find out just how good and dedicated this industry is at trying to improve Beef Quality Assurance. I am sure fortunate to be around so many smart people. I still think I have the best job in the world! This entry was posted in Uncategorized on September 24, 2018 by curtpate.